Tinker Air Force Base | Retirement......LOVE IT! This past weekend my husband and I traveled to Oklahoma City to visit our youngest son, his wife, and the three grandkids. That in itself is always a fun, never boring, exhausting entertaining time. However, this weekend was extra “special” in a couple of different ways. 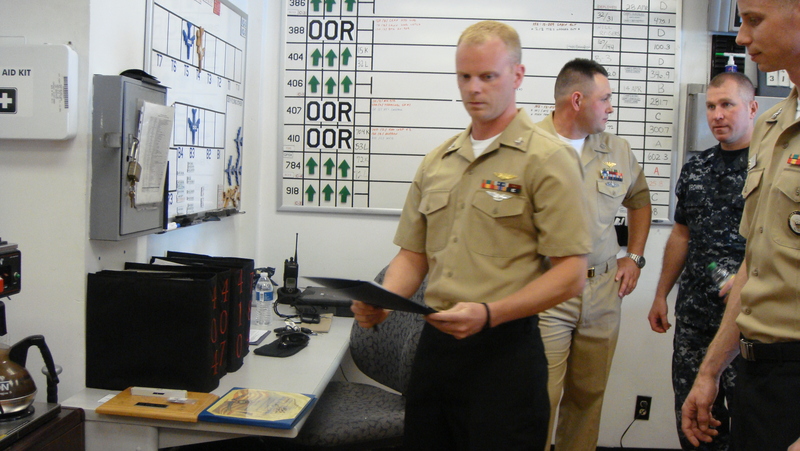 First of all, our youngest son, Mike, has been in the Navy since 2002. 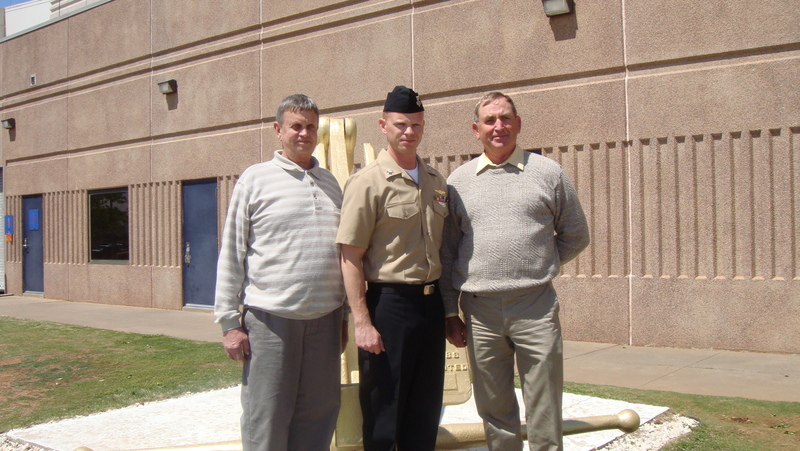 He flies for the Navy on the E6-B Mercury aircraft out of Tinker Air Force Base as a flight engineer. 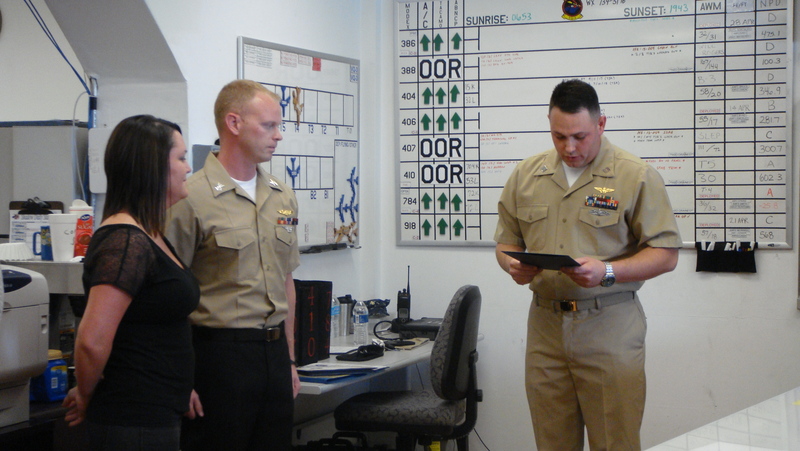 He and his wife made the decision to re-enlist for 6 more years (wives are important in making these decisions because military life is not easy for the spouses and families left at home when on deployments). 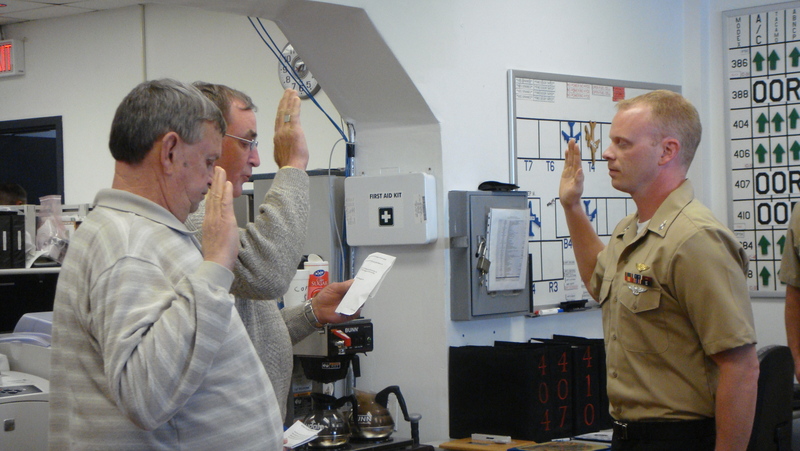 When enlisted personnel re -enlist in the military, they are actually given an honorable discharge first, then immediately sworn in again, followed by the signing of documents. This particular re-enlistment my son asked his two uncles (on my husband’s side of the family), who are both Viet Nam veterans, to swear him in. They both felt very honored and said immediately that they would be there. It was a short, informal ceremony, but it was very touching because of the uncles’ participation. My husband’s mother and sister were also present for the ceremony. Here are just a few of the pictures taken at the ceremony. 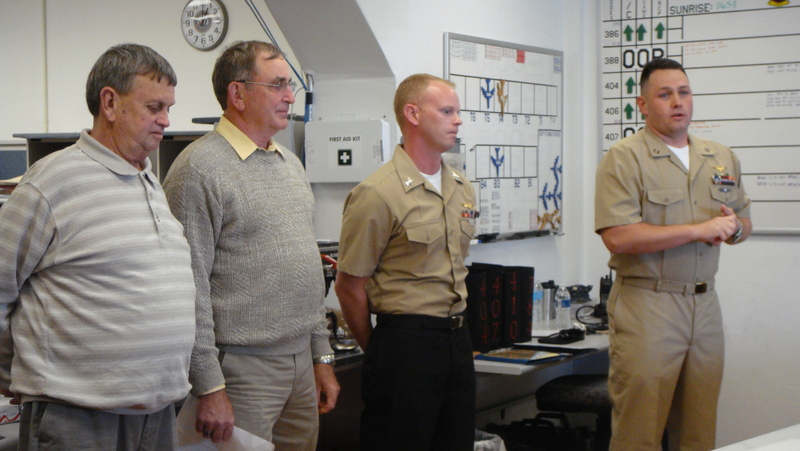 The presiding officer started with talking about Mike’s accomplishments thus far in the Navy. 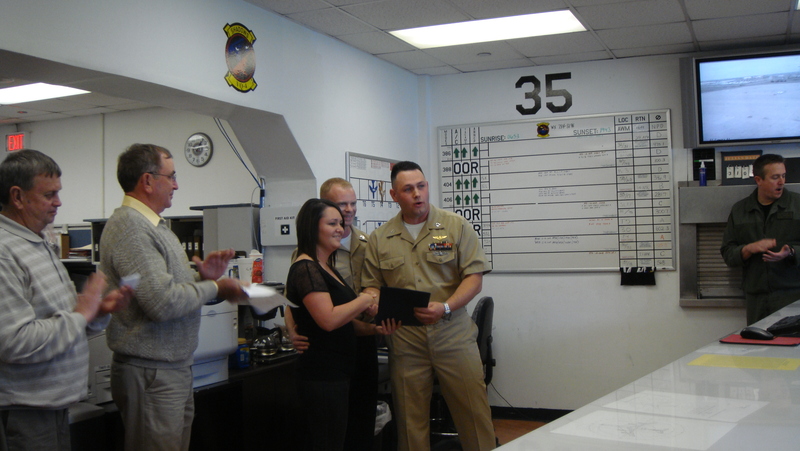 Then Mike’s wife, Jennifer, was recognized for the support she gives and the sacrifices she makes that allows Mike to do the job he does. I thought this was really nice! 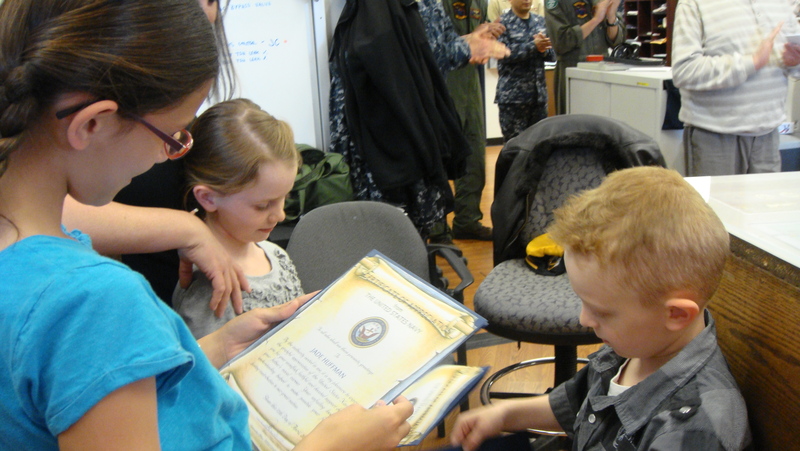 Mike’s three kids were also recognized for supporting their daddy’s career in the Navy. Now the “official” swearing-in begins. 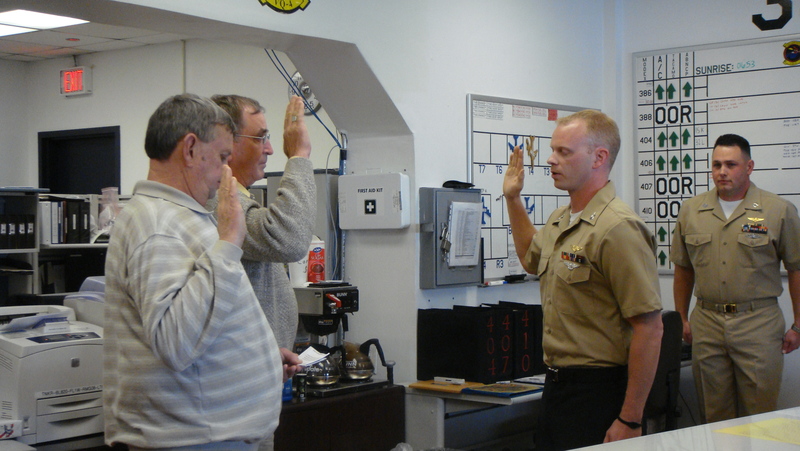 Uncle Delano (in the background) begins giving Mike the oath. 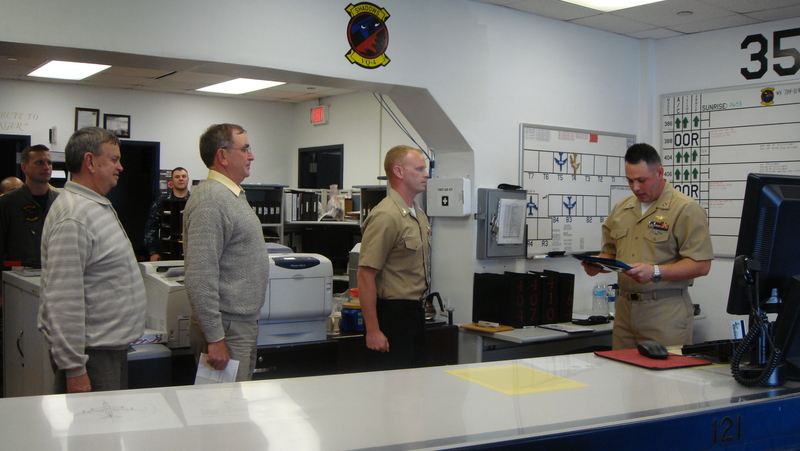 Uncle Carl (in the foreground) gives the last part of the oath. Documents are all signed and it’s now official. 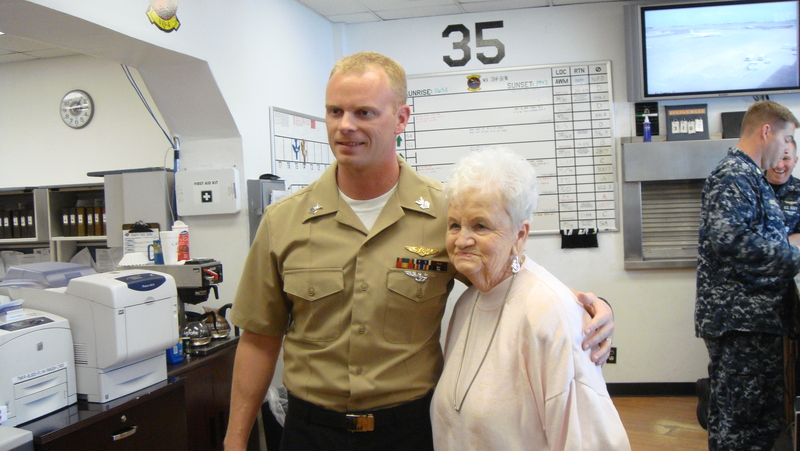 Mike with Grandma Huffman. She is quite proud! 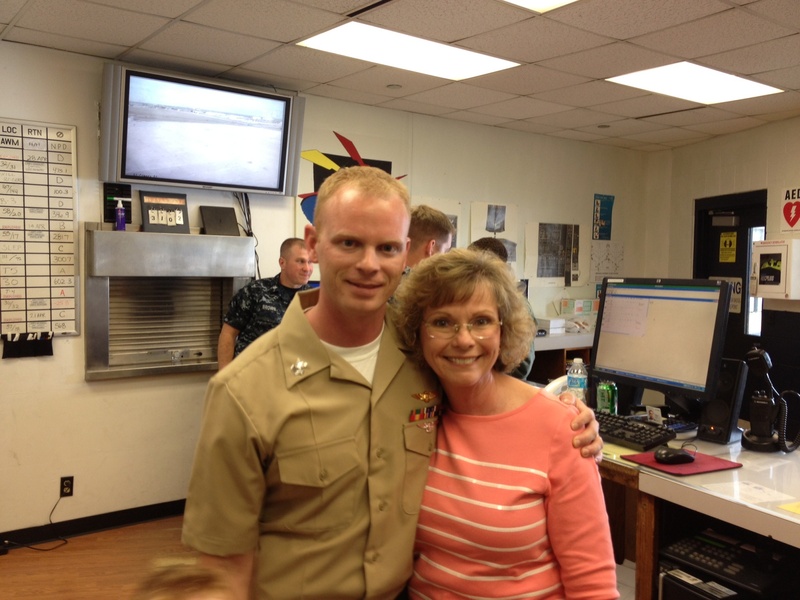 Mike with his proud mom — ME! 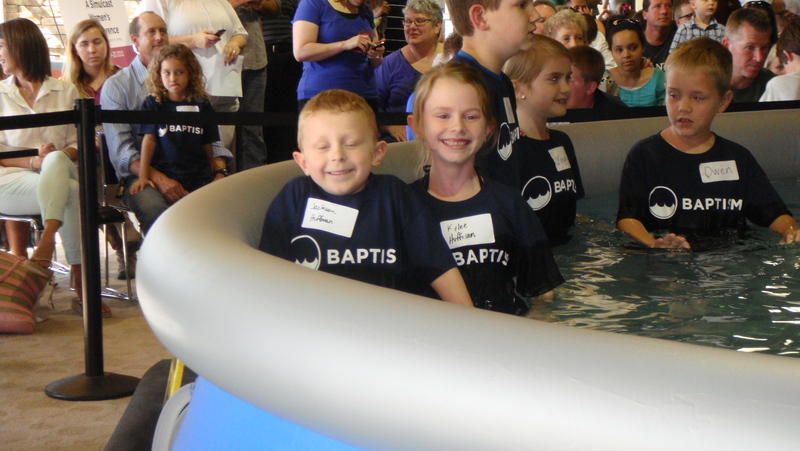 The other event that made this weekend extra special was the baptizing of two of our grandchildren. 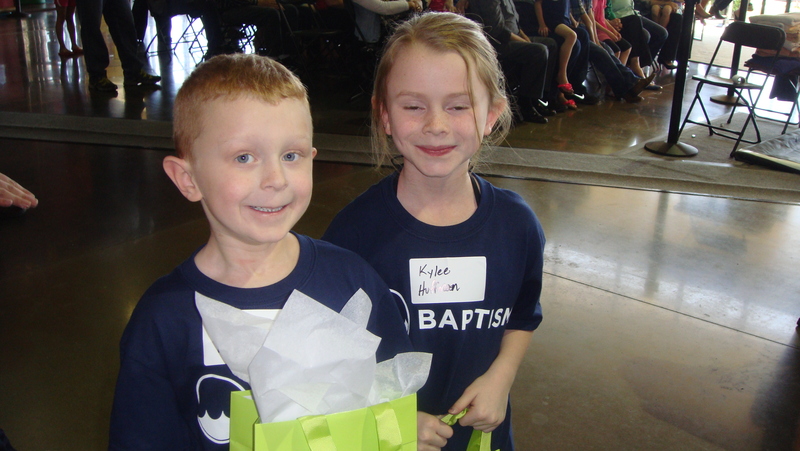 Kylee, age 7, and Jackson, age 6, were baptized Sunday afternoon at their church (Jade is 11 and was baptized last year). 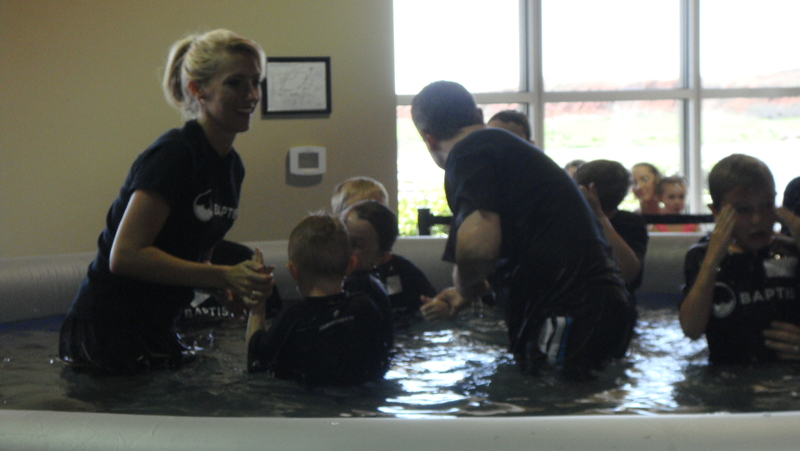 They go to a huge church, so there were about 30 people (mostly children) that were baptized. 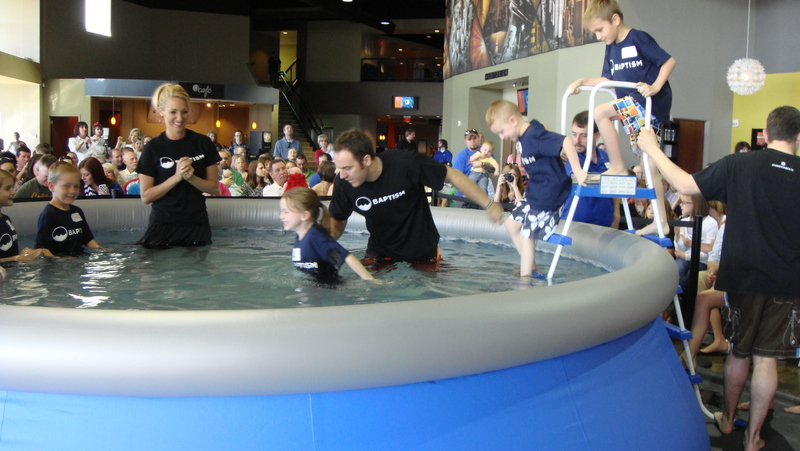 This church sets up a large, above -ground, blow-up swimming pool in their very big foyer area and has the baptisms there. 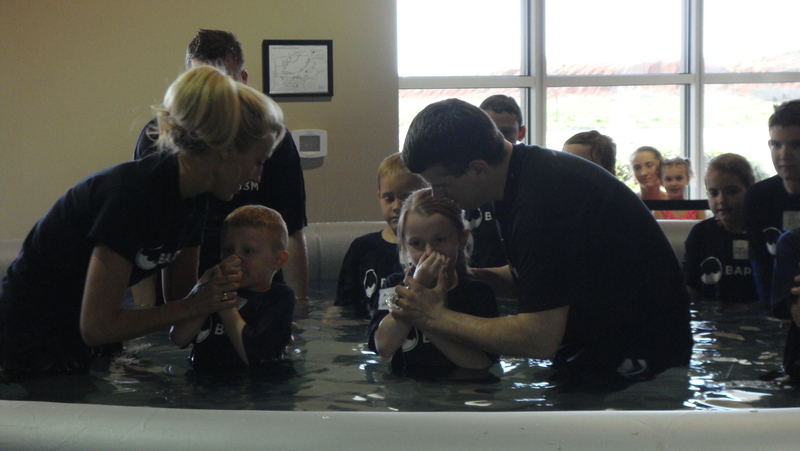 They baptize three at a time, so Kylee and Jackson were baptized at the same time. 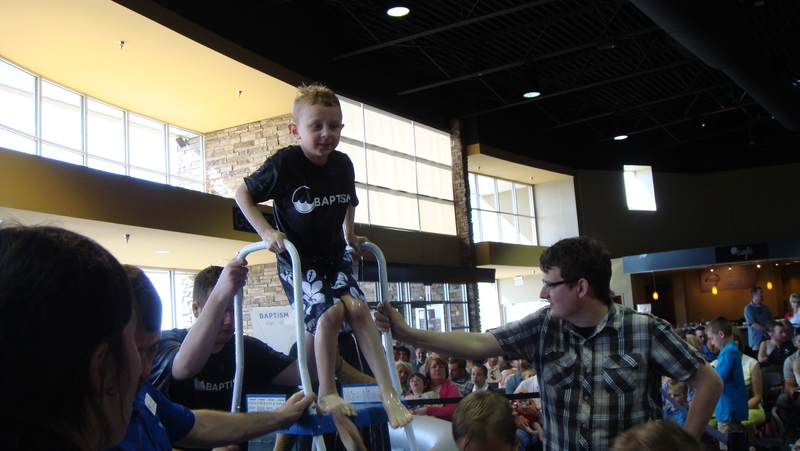 This was a very unusual different baptism service for my husband and I because of what we are used to at our own church, but contemporary churches do things differently and that’s a good thing. 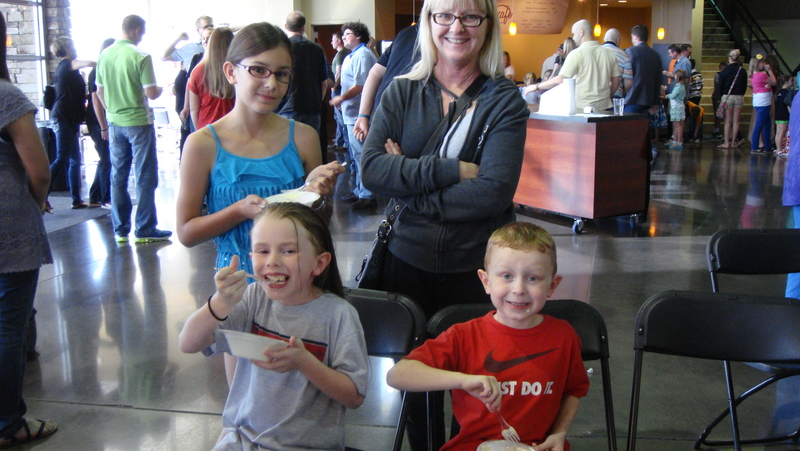 This church gives each person baptized a gift (a bible) before the baptizing and then “celebrate” afterwards with cake and ice cream. I won’t bore you with too many pictures, but I must share a few. 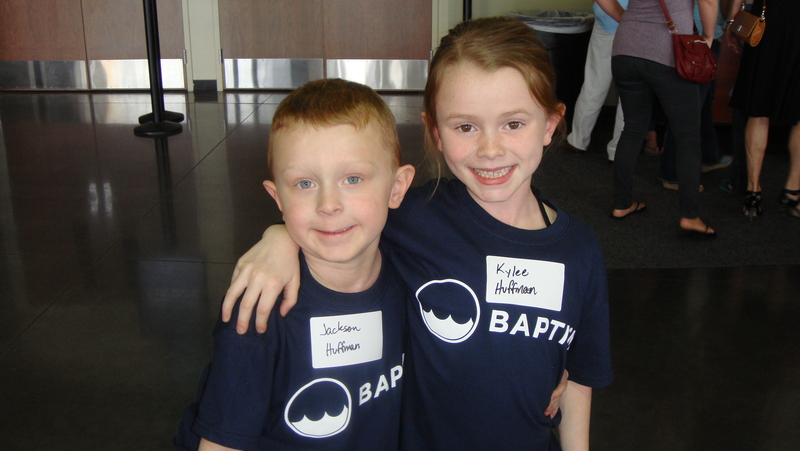 Kylee and Jackson have gotten their baptism t-shirt and are ready to go. They just received their brand, new bibles. 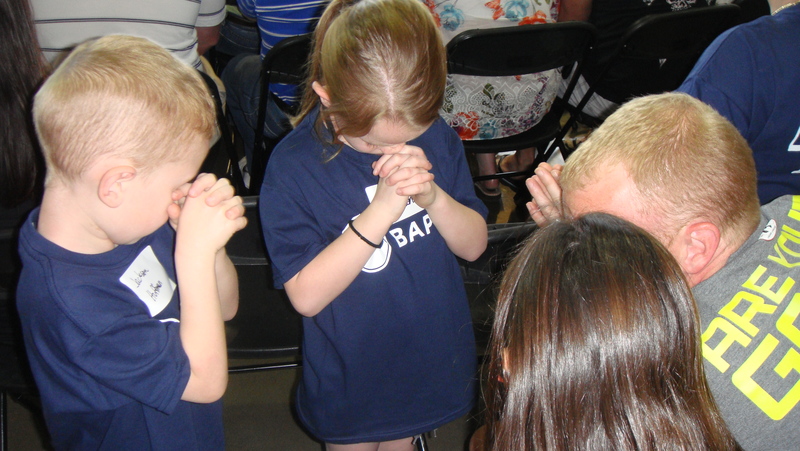 Families were asked to gather around and pray together before the baptisms. Here Mike is praying with his three kids. Into the pool we go!! Here we go: ONE, TWO, THREE…. That’s it — down and up! 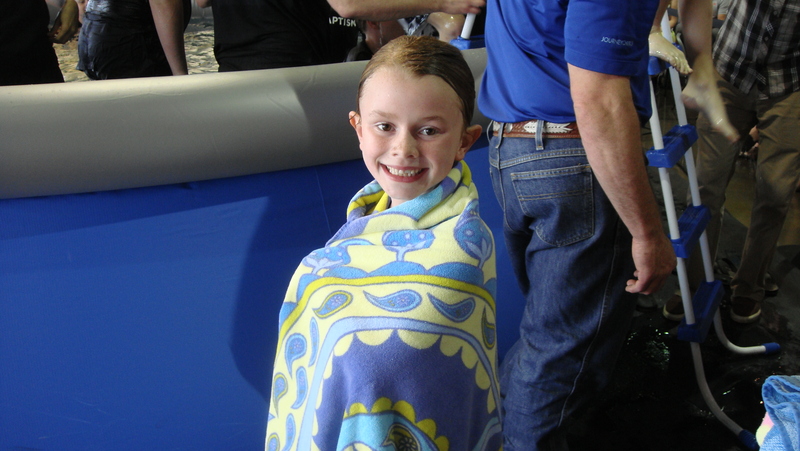 Kylee was one of the first ones out. I think she was cold. Jackson, of course, was the last one out. He was busy kicking and swimming around while he waited to climb out! Thanks for letting me share my wonderful weekend with you! Letting joy triumph over trauma, loss, sorrow, and the messiness of life.